July 21st is National Ice Cream Day. As if we need another reason to eat ice cream. This is a delightful rendition of ice cream without the dairy. The mint in this dish lightens the coconut milk and gives the dish a bit of brightness making it an extra refreshing treat. Blend all ingredients, except chocolate chips, until smooth. Freeze ice cream in your ice cream maker according to manufactures instructions. Stir in chocolate chips and place in your freezer until you are ready to enjoy. I used Rumple Minze which is a 100 proof peppermint schnapps. 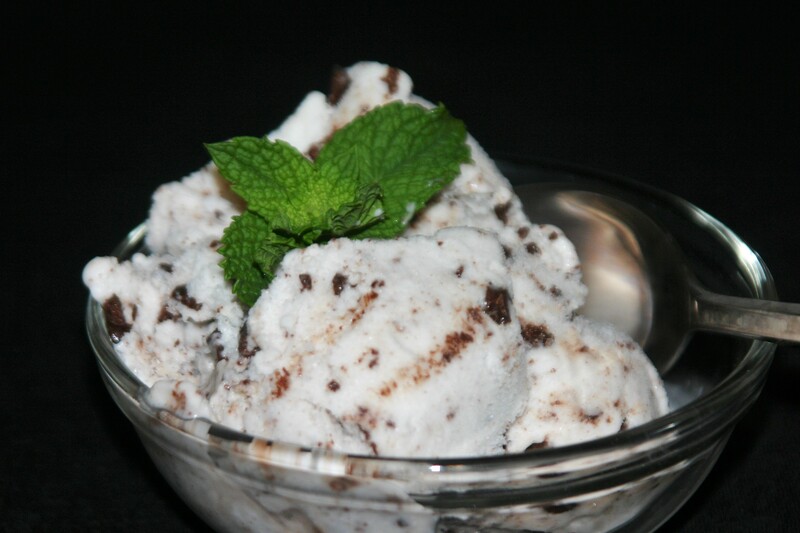 I used the schnapps for three reasons, it is sweet, has the flavor of peppermint, and has a high alcohol content which prevents the ice cream from freezing fully giving it a creamy texture even when it has been frozen overnight. I decided to give it a bit more sugar so it was sweet enough to be ice cream. I also amped up the peppermint flavor with peppermint extract. The dash of salt opens your taste buds and highlights the other flavors in the ice cream. Adding the chocolate chips at the end allows the ice cream to freeze more consistently, then brings a bit of texture to the party.